Santa Clara County is building a brand new $230 million Family Justice Center bordering St. James Park. The building will only be eight-stories tall, but will take up nearly a quarter million square feet on the block bound by West St. James, North First, DeVine, and North Market. 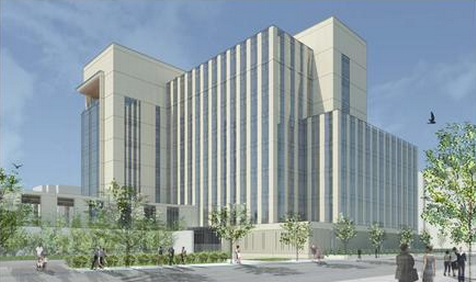 The building will contain 20 court rooms and consolidate various courts throughout the San Jose area. This will also open multiple new development opportunities throughout Downtown. Groundbreaking is scheduled to happen on July 16th! Hmm... well. I'm not sure I'm happy that this is getting built vs. waiting for something better to fill a prime block on Market St. 8 stories in the core of downtown is not an efficient use of the block. Plus, my gut reaction is that it looks just like the jail up on Hedding Street ... another blah government building. SJ City Hall is so amazing. This courthouse is not. Fingers crossed, they do something, anything to modernize the design. It is actually a lot taller than it looks. These are courthouses, so each floor is substantially taller than the standard 10-12 feet. I'm going to reserve judgement on the aesthetics until I see this thing in person. This is the view from Devine St, the St. James side has more glass. They haven't released any rendering showing what it'll look like from Market. The San Diego courthouse was designed by the same firm that did our City Hall, Richard Meier & Partners. In the future, I'd really like to see some of our major projects attract other "starchitects" in order insert some much needed architectural diversity into SJ. How do you know the height of each floor is any more than usual? This is a modern courthouse... more likely standard height. What's entirely annoying about this, and most other significant projects downtown is the lack of engagement with neighbors about the design. This is just another example of the city allowing really just anything, any design to fly in an effort to fill an empty lot. It's lame. This city will never deserve respect until sights are set higher. This is a building we'll be stuck with for the next 100+ years. And not mention of what's happening to the courts amd other offices that will consolidate into this peice of crap building. I assume most folks who write and read this blog don't live downtown? I do, and never heard about any attempt for public comment. No, not for this project. But there were public meetings for One South, Centerra, and Hampton Inn. Remember, One South and Hampton Inn used to look pretty *ugh* and folks at the meetings made sure the architects know that. And changes were made and both buildings' designs look much better in their current plans. There has been in the past a tendency to just let things fly , but the more recent years there have been a lot of effort by the City and especially SJ Downtown Association to put an emphasis on aesthetics and how the buildings would fit in the grand scheme of downtown's revival. In general if you visit the new development's site, you will see information on how to contact them for information on meetings and whatnot. I work in downtown, and I know about the public meetings for all the projects. It's pretty easy, just go to the site and look for the meeting info. I live downtown & two blocks from this land parcel. Never heard a word about the project other then through digging through the news -- and this awesome site! Thank you, Josh. No letters were mailed to me re: a community meeting like they do for the condo towers or even a little building change plan. Somehow, government buildings are exempt from the otherwise standard community meeting requirements? There are signs on the parcel (both the development notice and a 'future home' one). I'm pretty sure State projects don't require design review or community input. I'm almost certain there hasn't been any for the upcoming Spartan Stadium renovation/expansion either.